Many disorders can cause abnormal uterine bleeding. The most important step in any female patient with abnormal uterine bleeding or with pelvic or abdominal pain is to rule out pregnancy with a pregnancy test. Abnormal uterine bleeding can be due to structural causes such as a polyp, adenomyosis, leiomyoma, or endometrial cancer or endometrial hyperplasia. Abnormal uterine bleeding can be due to nonstructural causes such as coagulopathy (and the most common coagulopathy causing abnormal uterine bleeding is von Willebrand disease), and ovulatory dysfunction. Ovulatory dysfunction is one of the most common causes of abnormal uterine bleeding. Ovulatory dysfunction can be due to oligo-ovulation or anovulation and there is commonly associated with these disorders heavy irregular uterine bleeding. There are physiologic causes of anovulation (adolescence, perimenopause, lactation, and pregnancy). There are pathologic causes of anovulation (hypeandrogenic anovulation [for example polycystic ovary syndrome, congenital adrenal hyperplasia, or androgen producing tumors], hypothalamic dysfunction [for example, secondary to anorexia nervosa], hyperprolactinemia, thyroid disease, primary pituitary disease, premature ovarian failure, iatrogenic [for example secondary to chemotherapy or to radiation therapy], and medications. In order to establish that the abnormal uterine bleeding is due to ovarian dysfunction, it is necessary to be sure that the bleeding is not due to an anatomic cause or a coagulation problem (see table 2 above). Cycles that vary more than 10 days from each other are likely anovulatory. By far the most important thing that must be done for any patient with abnormal uterine bleeding is to rule out pregnancy. In general assessment for AUB-O includes as mentioned above, a pregnancy test, thyroid stimulating hormone level, prolactin level, and endometrial biopsy if there is a risk factor for endometrial hyperplasia or malignancy [age is the usual risk factor]. If the endometrial biopsy is insufficient to rule out endometrial hyperplasia or endometrial cancer or other structural problems, then it may be necessary to perform saline infusion sonohysterography, hysteroscopy, or transvaginal ultrasound. The most common cause of abnormal uterine bleeding in this age group is anovulation. If the bleeding becomes prolonged or excessive it may require pharmacologic therapy. The risk of endometrial hyperplasia and malignancy in teens is very low. Abnormal uterine bleeding can be due to a coagulation disorders such as von Willebrand disease (if suspected, referral to a hematologist is in order as the diagnosis can be difficult). Teens who have to be hospitalized for AUB have a 20 to 30% risk of having a coagulation disorder. Indications for hospitalization include the requirement for blood transfusion or presentation with a hemoglobin level of less than 10 g/dL. Regardless of what the patient tells you, you must test for pregnancy and STDs and sexual trauma. ACOG (American College of obstetrics and gynecology) recommends that polycystic ovarian syndrome, in this age group, should be looked for clinically by looking for signs of hyper androgen is on physical exam (acne, hirsutism). For treatment recommendations in this age group please see ACOG’s “summary of recommendations and conclusions” at the end of this post. The evaluation and treatment of this age group is essentially the same as that of teens. Polycystic ovarian syndrome is a common cause of AUB-O in this age group. And endometrial hyperplasia or endometrial carcinoma should at least be considered in this age group. Endometrial pathology should be especially considered and evaluated if the patient fails to respond to medical therapy. It is critical to remember that patients in this age group can become pregnant. And so every woman should have a pregnancy test until one year past her last menstrual period. The evaluation and treatment of these patients is the same as that of previous groups with one exception. The likelihood of endometrial hyperplasia and endometrial cancer increases in this age group and so endometrial evaluation should be considered. Failure of medical management of presumed Abnormal Uterine Bleeding Secondary to Ovulatory Dysfunction should lead to consideration of evaluation for endometrial hyperplasia or endometrial carcinoma. What is an adequate evaluation for endometrial hyperplasia or endometrial carcinoma (when evaluation is considered)? There is no consensus among experts. But the topic is reviewed and resources presented in the post Post-Menopausal Bleeding post (coming soon). The levonorgestrel IUD has been shown to be effective in treating a UB and should be considered for all age groups. Medical treatment options for AUB-O include progestin therapy and combined hormonal contraception. Women who have completed childbearing, in whom medical therapy has failed, or who have contraindications to medical therapy are candidates for hysterectomy without cervical preservation. Because a AUB-o an endocrinologic abnormality, the underlying disorder should be treated medically rather than surgically. Surgical therapy is rarely indicated for the treatment of AUB-O, unless medical therapy fails, is contraindicated, is not tolerated by the patient, or the patient has concomitant significant intracavitary lesions. Failure of medical management requires further investigation, including imaging or hysterectomy. The choice of treatment of a AUB-O is guided by the goals of therapy, which may be to stop acute bleeding, avoid the future irregular or heavy bleeding, simultaneously provide contraception, and prevent complications such as anemia, unnecessary surgical intervention, and diminished quality of life. Endometrial ablation is not recommended as a first-line therapy for AUB-O. Physicians must provide thorough informed consent and adequate counseling to women with a UB oh who desire endometrial ablation. 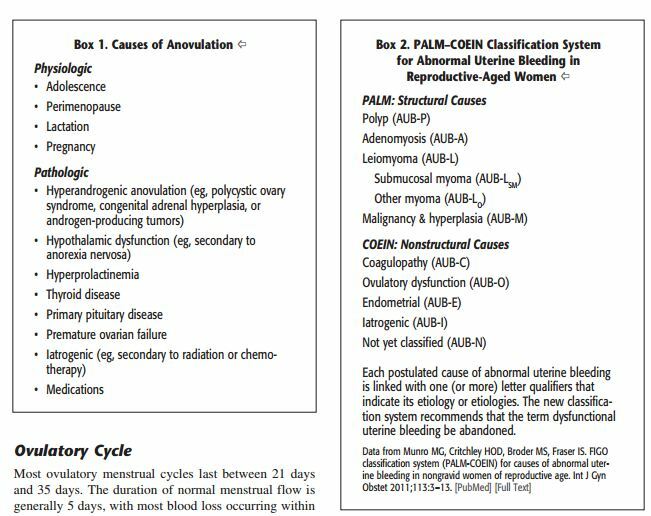 (1) American College of Obstetrics and Gynecology 2013 Practice Bulletin: Management of Abnormal Uterine Bleeding Associated With Ovulatory Dysfunction. This entry was posted in Emergency Medicine, Obstetrics and Gynecology, Pediatrics. Bookmark the permalink.